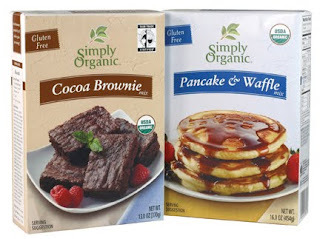 Adding to its growing line of gluten-free baking mixes, Simply Organic has introduced Cocoa Brownie and Pancake & Waffle mixes. Both of the new mixes are vegan and have USDA organic certification. “Both of our new mixes require only two additional ingredients and can take less than five minutes to prepare, so they are convenient and relatively inexpensive,” says Kory Kazimour, Simply Organic Senior Brand Manager, in a statement. The all-natural Cocoa Brownie mix contains Fair Trade Certified sugar and cocoa. The mixes, which have an 18-month shelf life, are free of hydrolyzed vegetable protein, modified food starch, hydrogenated oils and genetically engineered ingredients. Recipe suggestions are provided on each package as well as on the Simply Organic website recipe page. The new varieties complement the company's other gluten-free, Fair Trade Certified baking mixes, such as its Carrot Cake, Chai Spice Scone, Banana Bread, Cocoa Cayenne Cupcake and Honeypot Ginger Cookie mixes. Most natural and organic retailers will have the new products, priced at $4.99 per box, in their stores in the coming months. However, consumers can purchase them now direct from Simply Organic online or by calling the company toll-free at 1-800-669-3275. One percent of sales on all Simply Organic spices, seasonings, flavors and mixes goes to support organic agriculture through research, education and grower development.